In part one of The Dos And Don’ts Of Working Away From Home we looked at some simple but serious rules to make sure your time working away from home goes off without a hitch. In this second part – for a bit of fun – we let our hair down a little and offer 10 more top tips that are more off-the-wall. Still, you never know when a piece of this sage advice could come in handy. DON’T STEAL THE KETTLE – Shortbread biscuits? That’s fine. The kettle? Not fine. Neither should you be waltzing out the room with the luxury towels, the leopard-print bathrobe or the Corby trouser press. We know they look inviting – especially that trouser press – but the last thing you want is your boss hauling you in the office to ask why there’s a hotel manager on the phone trying to expense a (previously) wall-mounted 42-inch plasma TV to your firm. 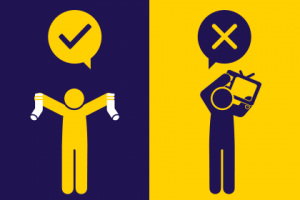 DO MAKE SURE YOUR SOCKS MATCH – Packing the correct underwear is a real weak spot in the world of business travel. If it’s not under accounting for the amount you need, it’s that you’ve taken miss-matched bra and knickers or colour combinations of socks that should never be seen together. Make sure you check you’re all matched up before you leave. DON’T EVER GO COMMANDO – Going ‘commando’ without any underwear is risky at the best of times, but when you’re travelling for work, it’s downright dangerous. Neither of us wants to get to descriptive here, but a little imagination goes a long way when thinking about nightmares that could unfold in a meeting or on site due to it being a little too breezy in the boxer department. DON’T SMOKE IN THE HOTEL – It’s one of the biggest complaints we hear from hotels and it’s the fastest way to run into a problem with your stay. Despite it having been illegal for years now, people still try to sneak in a crafty one. Aside from angering the hotel, you run the risk of the sprinkler going off and causing some major embarrassment. DO MAKE FRIENDS – Travelling for business can be a real solitary exercise sometimes and it’s easy to start to feel detached from your family and friends. That’s why we advise taking all the opportunities you can to hook up with colleagues who might be travelling with you, or arrange social events with the clients you’re traveling to see. In fact, sometimes the best deals can be struck off site in a more relaxed atmosphere. DON’T DO ANYTHING YOUR PARENTS WOULDN’T – Once upon a time it was the standard storyline of many a cheap Hollywood film. There you are at the hotel bar, tired, weary and alone. In they walk, the smouldering stranger. Don’t screw things up. Real life is not a clichéd Hollywood movie and, besides, a Premier Inn on the North Circular does not make for a romantic setting. DON’T THROW THE TV OUT THE WINDOW – Even if the TV will only show one channel that’s stuck on a loop of Celebrity Love Island, do not be tempted to chuck it out the window a la Mick Jagger. And I’m not just talking about the TV here. Don’t throw anything out the window…the kettle, the bedside lamp, especially not that Corby trouser press. DON’T BOOK WITHOUT RAPID ACCOMMODATION –Problems checking in, a noisy neighbour, parking is a mile from the hotel…these are all problems one of our dedicated Travel Assistants will make sure you never have. Make sure you don’t ever travel without our number in your contacts. Add 0330 090 41 42 to your contacts today or email us at info@rapidaccommodation.com to find out how we can make sure you don’t have any problems and do have a great time on your next business trip.